Sunshine was the order of the day at Rockliffe Park the training ground of the Wembley bound Boro, but Sunday 17th May gave way for the finals of the TJFA league and challenge cups which teams of all ages compete to play their respective finals at this fine venue. Stockton town u7’s were lucky enough to win through to the final to play Bishop Auckland and the big crowd that turned out to watch these two teams play were treated to one heck of a game. Stockton kicked off and was immediately behind as Bishops stole possession and scored a fine goal. In stepped Ashton Johnson to add some much needed steel to the middle of the park but again it was Bishops who were cool and calm and Stockton were looking nervous, Bishops grasped this and after some fine approach play a vicious cross resulted in a second Bishops goal. A couple of substitutes seemed to calm Stockton down and they began to play flowing football, chances started to be created and a crisp passing move saw Kai Walker grab a well finished goal. Thanks to the no nonsense in your face approach of Matty Hill Stockton were now in the ascendancy and finished the half strongly. The second half began like the first with Bishops pressing again but fine defensive work and an alert Ollie Beddard in goal smothered the danger. Another great ball from defence saw an equaliser for Stockton as a dangerous ball across the box by Joseph Kennedy allowed the alert Miller Squires to slot home. Again Stockton asserted themselves on the game and both teams tried to grab that crucial winning goal with first Stockton hitting the post then Bishops have a corner flash across the goal when any touch would have won it. Extra time began with both teams who had gave so much in normal play going again with Seb Bowerman now starting to show his vast array of passing skills as legs were tiring. Stockton won a free kick and a fabulous strike from Joseph Kennedy gave Stockton the lead, Bishops had to gamble now and Zac Greenhough the Stockton captain held firm and still played his trade mark touchline passes to start more attacks. Another short free kick allowed a crucial 4th goal for Stockton as a bobbling ball was slotted in by Squires. This calmed Daz Lee and the numerous Stockton supporters down but a 3rd goal from Bishops meant a nervy finish. The final whistle was greeted with some ecstatic scenes of jubilation from the Stockton Town players and fans alike. What a final a big well done to Bishops you played your part in an excellent advert for u7’s football and a big well done to the young referee who was firm but fair and equal with his decisions. 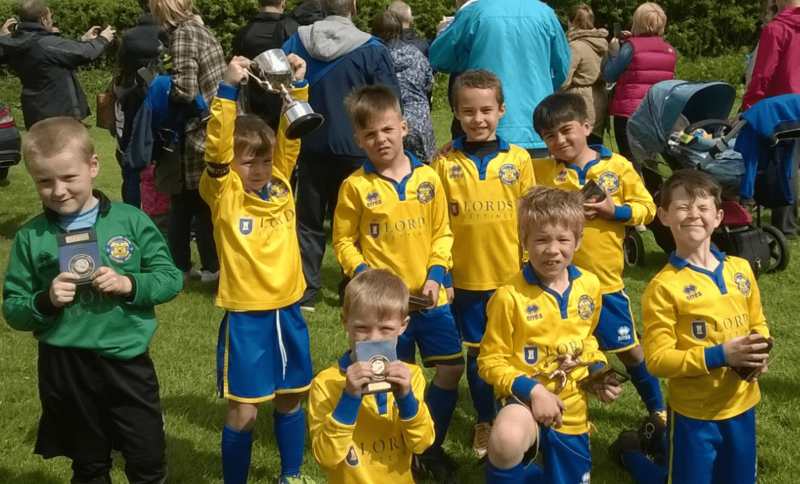 CUP WINNERS STOCKTON TOWN FC U7’S YELLOWS. Winning Players as follows OLLIE BEDDARD, SEB BOWERMAN, ZAC GREENHOUGH, MATTY HILL, ASHTON JOHNSON, JOSEPH KENNEDY, MILLER SQUIRES, KAI WALKER. Great end to a fabulous season boys!